Common practice for Nissan and Datsun at the time, the Nissan Sunny B-Series including the B210 was offered in multiple body style options. The style combined with the low cost and high MPG made the B210 series popular with Americans during the 1970s. Outline below are the various body styles the Datsun B210 nameplate was made available in. 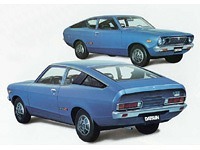 One of the most popular and unique style wise was the Datsun B210 Hatchback or “fastback” coupe body style. This body style can sometimes at first glance be confused for the Two Door Sedan (and vice-versa) however the full hatch-style rear sloping lid as opposed to the separate trunk lid and rear glass is the key difference. Today this is the most common body style to be found on the used market for sale. In addition, it is also still highly searched for on Google, Craigslist and eBay. 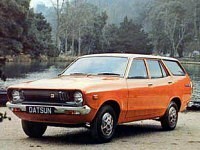 The wagon version of the Datsun B210 was available in two distinct configurations. Both a three (3) and five (5) door option were made available. ***Note that this door count includes the hatch door in the rear as a door. The Datsun B210 Wagon is the rarest body style for sale on Craigslist/eBay and this site. Partly due to the resurgence in vintage wagon interest, the B210 Wagon body style is the most searched for body style on the internet. These two factors combined makes the B210 Wagon a rare and valuable find for potential buyers. It should be noted that the early generation (1973 – 1977) wagons were never made available in North America. These were only sold in Japan. So you will likely not see any of these listed for sale on this website. Later model 1977-1981 were made available and marketed as a B210 in America, however were technically a B310 by official designation. 1982 and 1983 wagons were technically B11s and look much different than earlier models. 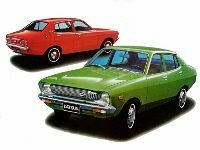 Datsun also marketed and sold both two and four door coupe versions of the B210. Although today many modern car buyers would consider these styles to be coupes or smaller cars. You will see some sellers refer to the two door version as a coupe for this reason, however the key difference as noted above is the separate trunk lid and rear glass. If the B210 you are looking at has this feature it is technically a two door sedan. According to the Wikipedia entry for the B210 series, the Sedan version was the least popular of the three body styles. Despite this assertion there tends to be an even amount of sedans to hatchbacks for sale online, although the four door version is much rarer. Anything we missed? The post above is a living-breathing document so any feedback you can provide us in the comments section below is much appreciated.